Before the New Year, we finally got a first look at Ben Affleck in director David Fincher's adaptation of Gone Girl, based on Gillian Flynn's best-selling novel of the same name. In the film, Affleck is looking for his missing wife (Rosamund Pike), but he also becomes the prime suspect in the case. 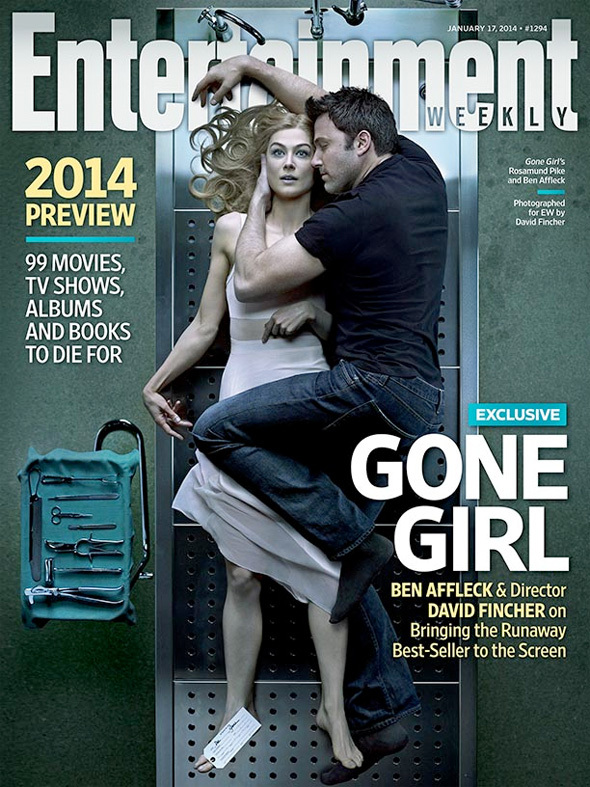 Now we get another odd look at the film thanks to the film being the cover story for Entertainment Weekly. Seemingly taking cues from the iconic Rolling Stone cover with John Lennon and Yoko Ono, the cover has Affleck lovingly embracing a clearly dead Pike on a table at the morgue. It's kind of disturbing, but feels like Fincher's style. Gone Girl, being directed by David Fincher (of Seven, The Game, Fight Club, Zodiac, Panic Room, The Curious Case of Benjamin Button, The Social Network, The Girl with the Dragon Tattoo previously), is an adaptation of Gillian Flynn's best-selling novel of the same name. In a story primarily told in flashbacks, Rosamund Pike plays a wife who goes missing on her fifth wedding anniversary, and her husband (Ben Affleck) becomes the prime suspect in her disappearance. Fincher is currently filming in Missouri utilizing the new 6K Red Dragon digital camera. 20th Century Fox releases the film on October 3rd. Stay tuned. every Fincher movie is a great movie! So it's on top of my list! I'm interested in seeing how much of the book makes it on film. The whole third act is bumpy and kind of jarring. Don't get me wrong, it's a crazy good story! Anyone agree? Can I just say how much I love David Fincher!? I can't wait to see his new work! Wait...where have I been? Fincher is directing this? I remember reading that he was involved in some way, but I didn't know he was directing. That's awesome. Holy crap there needs to be a trailer asap, thats a insane cover lol love fincher. That's a nice and creepy cover. Really plays up the film's plot about whether or not he actually killed her. Big fan of Rosamund Pike and Affleck is kind of underrated as an actor (or so I've discovered). Looking good!